It feels solid and well-made. It looks great, but it's not so dainty that I feel like I need to coddle it. It's a fantastic writer across a wide range of ink and paper conditions. It's amazingly neat and simple to both ink up and clean out. In many ways, the Vanishing Point embodies the ethos that I aspire to with this site: it pays homage to the great tools of the past in a modern and practical package. The Vanishing Point comes in a number of appealing color combinations, but Ed Jelley's photo post on the gunmetal and black matte version made my first purchase decision very easy for me. I went with a black-plated nib in mine, which suits the stealthy look of the pen perfectly. I've become such a big fan of this pen that I actually added a second Vanishing Point to my collection last week. 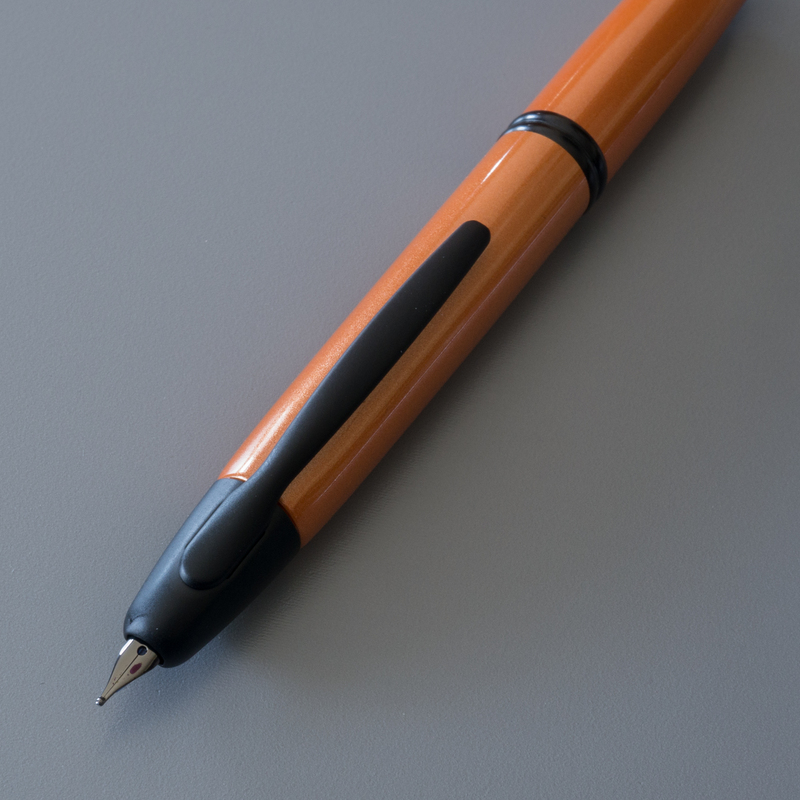 My latest addition is the desert orange and black matte version, once again with a black-plated nib. The gunmetal and black matte Vanishing Point is an extremely attractive pen, but it's not flashy. When I use it at the office, it's rare that "normals" even realize that I am using a fountain pen. But it's kind of like pen geek radar. The one person in the room who does notice it really notices it. Even though I love orange, I hesitated for quite a while before purchasing the orange and matte black model. The color metallic Vanishing Points have always struck me as a bit schizophrenic. Are they trying to be flashy, or are they trying to be stealth? However, the orange is actually a bit darker in person than it appeared to me in photos online, and I am quite happy with its appearance. 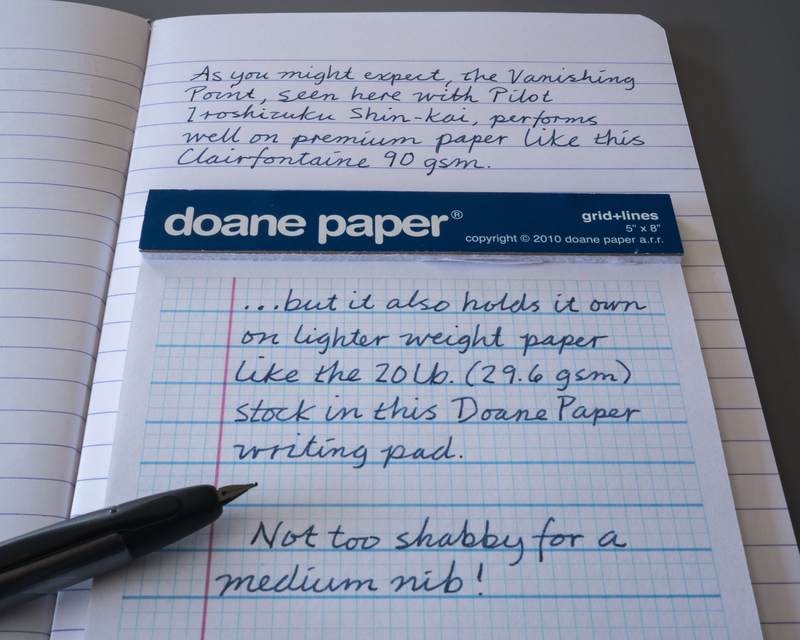 The most distinguishing feature of the Vanishing Point is its unique retractable nib design. Clicking the pen knock opens a small door at the tip of the pen and extends the nib out of the pen body for use. Clicking it again retracts the nib back into the pen body. This click mechanism is rock solid. It operates flawlessly every time, and the above-average level of resistance gives it a much more premium feel than a garden variety "clicky pen." One of the most polarizing aspects of the Vanishing Point's design is the clip location. The Vanishing Point's clip is located on the same end of the pen as the nib. This has the practical benefit of keeping the nib pointed up when the pen is clipped in a pocket. However, some people may find the clip location distracting or uncomfortable depending upon how they grip the pen. I am still relatively early in my fountain pen journey, but the Vanishing Point is the nicest writer I've used so far bar none. The Vanishing Point nibs sit on finer end of the spectrum, and the medium that I opted for has been perfect for me. It's just broad enough for me to fully appreciate the ink I am using, but it's also very practical in its role as a daily workhorse for journaling and note-taking. The Vanishing Point was my first pen with an 18-karat gold nib, and I definitely noticed a difference from my steel nib pens. But unlike some of the other gold nib pens I've tried since, the Vanishing Point feels and performs very well on a wide range of paper qualities. It's extremely versatile. The clip position took a little bit of time to get used to, but it has actually turned into a positive for me over time. It doesn't interfere with my grip, but it gives me just enough tactile feedback to know that I have the nib lined up correctly. The combination of this and the click mechanism makes it possible for me to grab this pen off my desk and get writing quickly without even looking directly at the pen. This makes it great for everyday use. The Vanishing Point feels very solid in the hand. At 30 grams, it's a bit heavier than my entry-level fountain pens. However, it's balanced extremely well, and I enjoy writing with it for extended periods. The fit and finish are also high quality throughout. There is no aspect of the pen that feels like corners were cut. Everything down to the threading to assemble and disassemble the pen has a smooth, precision feel to it. One of the under-appreciated aspects of this pen is that it is extremely easy to both ink up and clean out. The retractable mechanism uses a metal interior nib unit that is very easy to remove. When inking the pen up from a bottle using the included Pilot CON-50 converter, you insert just the nib unit into the bottle, which makes cleanup much easier than it is with pens that require dipping up to the beginning of the grip. 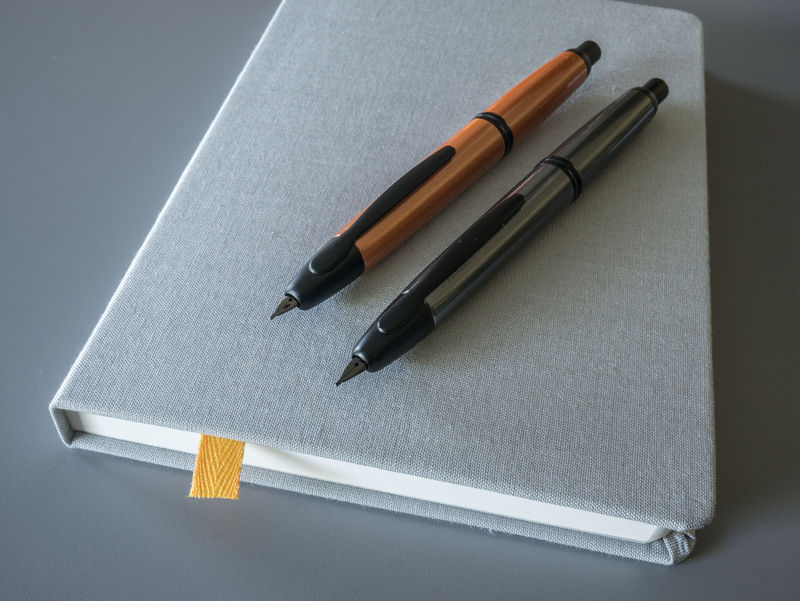 With the help of an included metal protective cap, the Vanishing Point also accepts standard Pilot proprietary ink cartridges for added flexibility. While I mostly use bottled ink, it's handy to be able to throw some Pilot blue black cartridges into my bag if I am traveling. The easily removable nib unit also makes flushing the pen very easy. The standard bulb syringe that I picked up at my local pharmacy forms a perfect seal with the Pilot nib unit, so I can flush nearly all of the ink out with one long squeeze. Cleaning inside the barrel down by nib door is a bit more dicey. I use Brian Goulet's tip of just putting a few drops of water in there, holding my thumb over the opening, shaking it, and then pouring it out. I have no idea if this is a Pilot-approved practice, but it's worked out well for me so far. This pen is one of those rare items that I've dropped a non-trivial amount of money on (street price: $140) that feels like a bargain months later. I use it daily. The more experienced I become with fountain pens, the more I appreciate it. And whether I am using it or servicing it, it always feels easy.